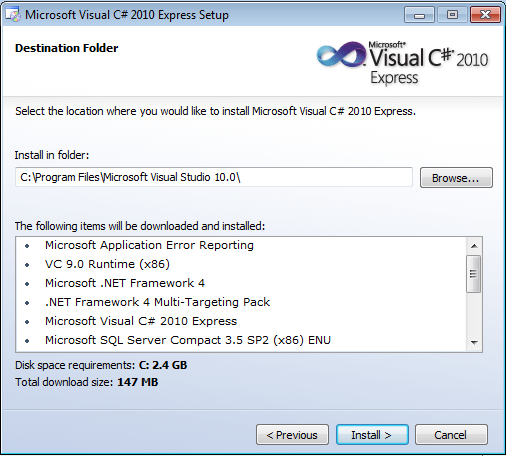 Microsoft now offers Visual Studio 2010 in an Express edition–which is free. 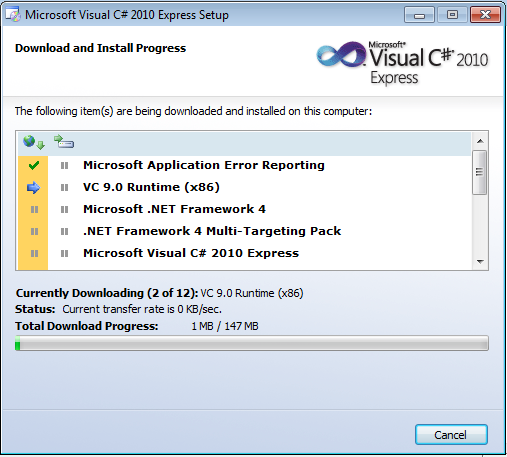 You’re limited to a single language, but you can develop WPF applications using Express. 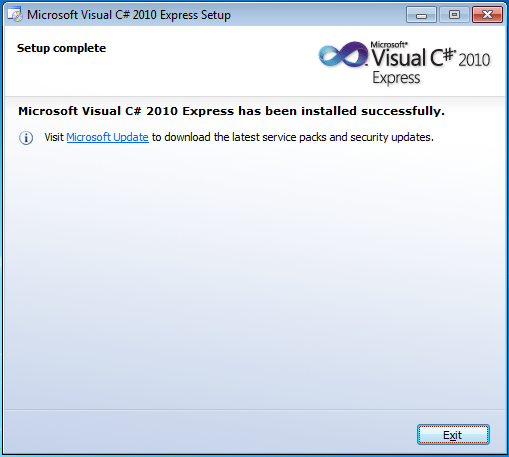 In this post, I walk through the exact steps to install and use Visual Studio 2010 Express (C# edition). The install was done a clean Windows 7 machine. 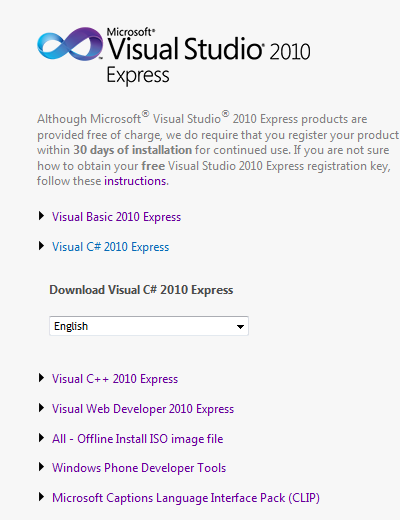 To start with, go to the Microsoft Express download site. Click on the link for the development language of your choice (e.g. 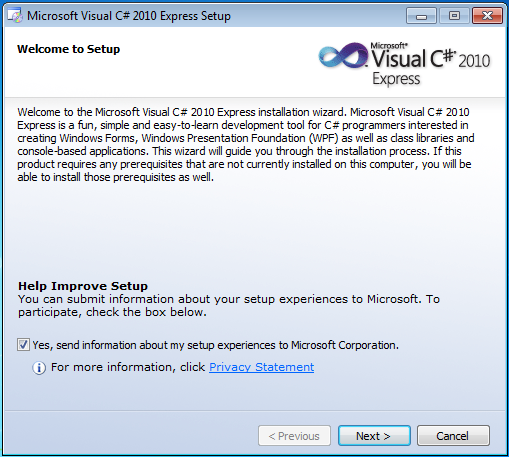 C#, VB, C++) and then select a language (e.g. English). 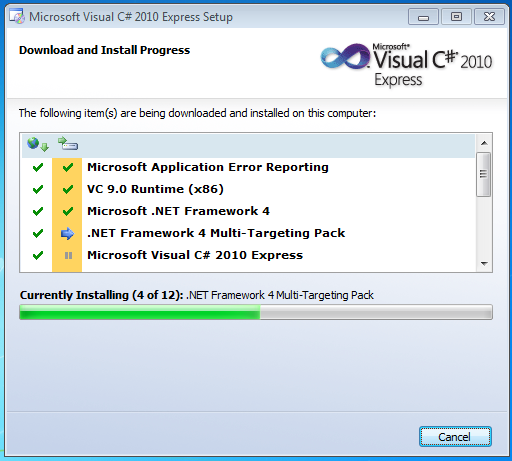 The install package will start downloading. This will download file named vcs_web.exe. Double-click on the file to start the install process. 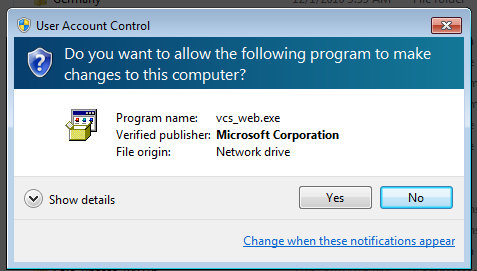 Click Yes on the UAC dialog. You’ll get to the first install dialog. Be a good citizen and agree to send information about your “setup experience” back to Microsoft. After all, they’re giving you a free product. 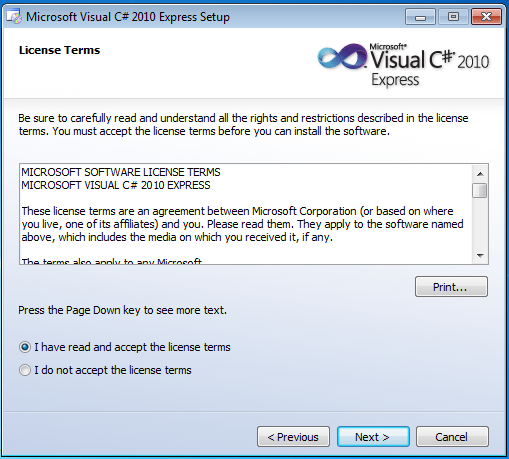 Carefully read every word in the license agreement and then agree to it. (Yes, of course I’m being tongue-in-cheek when I say to read every word). 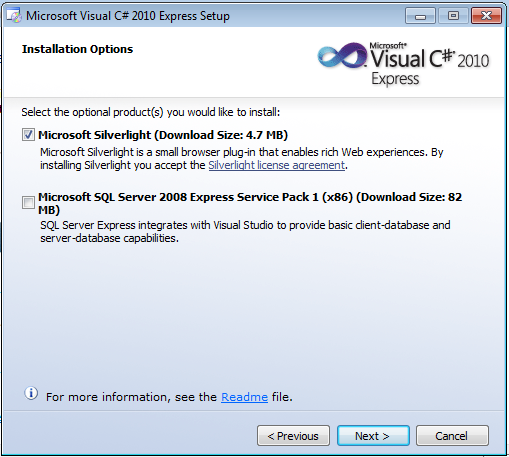 You can optionally decide to install Silverlight and/or SQL Server Express. For this example, I’ll install Silverlight only. Decide what directory to install into. The default is fine. Things start downloading and installing. Sit back and wait–this will take a while. You may need to restart in the middle of the installation. After the reboot, the install continues. Your patience will eventually be rewarded, as the installation completes. Oh wait–one more restart, just for good measure. 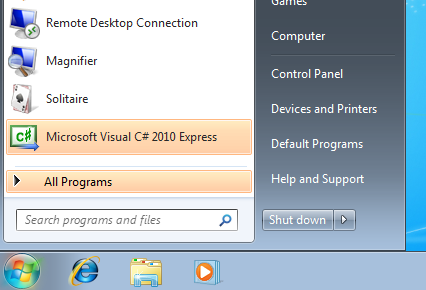 Now you’ll see Visual Studio C# 2010 Express in your Start Menu. (Notice that we can’t create Silverlight projects–the Silverlight option that we chose during the install likely just installed the Silverlight runtime, rather than the Silverlight tools for Visual Studio). At this point, you’re all set. 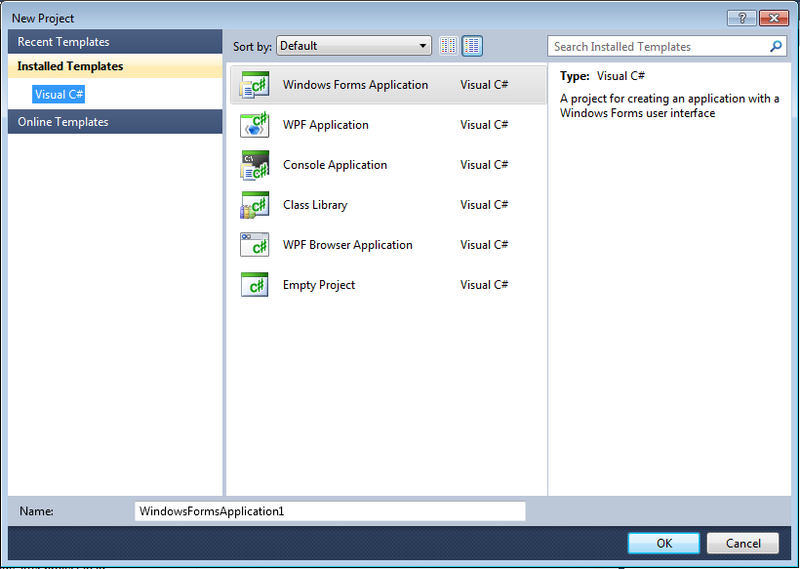 You have everything that you need, to create Windows client applications–either Windows Forms or WPF. If you’re building something new, you’ll likely want to start with WPF.